In the second Affrice tabula of the 1482 edition the following names used by Leonardo are found The nameplate with the following indication �. affrica . minor.� is in fact inscribed in the part of the illustration where the names we are interested in appear. : �trigon fl.�; �triton palus�; �pallas palus�, and, written exactly below the mark for the southern swamp (the highest with regard to the course of the river) � whose name has been omitted � is the name of a Libyan race, Cf. Smith�s Dictionary cited above, II, pg. 357. �Mimaces�, The same name is found again in the centre of the �quarta et ultima Affrice tabula�, and Ptolemy�s text refers to this, V, 6. which because of the indistinct markings of the second and third letters certainly gave rise to Leonardo�s �munace�. In the 1490 edition instead we find, for the corresponding illustration, the names: �. Triton. F. �; �Tritonitis palvs�; � . Pallas . palvs. �; � . Libya . Palvs.� (avoiding with this last name the omission of the Ulm edition), In the text (IV, 3, Affrice minoris situs) the Ulm edition offers the following captions: �Trigonis fl. ostia�; �Triton amnis: et in ipso paludes, Tritone scilicet . . . Et pallas palus . . . Et que vocatur libia palus�. and below : �Mimaces�. On the same sheet of the Leicester manuscript showing the geographic names now mentioned, Leonardo speaks of the swamps of the Nile, marked on the fourth and last Affrice tabula, and refers to information about the origin Cf. also the Atlantic Codex, 95 v.-b (crossed out passages). of this river: �montes lune: ab hys montibus nili paludes niues suscipiunt� (see also the first illustration, world map, of the Cosmography). And earlier, Leonardo had made mention of the Rhine and its derivation from lakes of �gostantia�, �curia� and �lucerne�, as suggested to him by the representation of the illustration inserted, in the 1482 edition Here Leonardo also found Lake Geneva, crossed by the Rodano indicated; despite this seeming to be a fact that could easily be recalled from memory without the help of the map. On the same illustration we find �bordeos� marked along the Atlantic coast, near the mouth of the �garumpna. vel . girunda�; but the information given on sheet 27v. 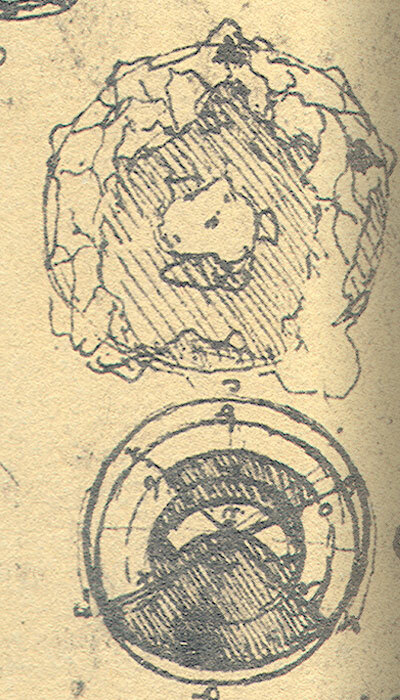 by Leonardo probably did not require consultation of the map. , after the tercia Europe tabula, and missing in the 1490 Rome edition. Without stopping to point out all the geographical indications scattered throughout the Leicester manuscript, it should be observed that two other pages, as well as those examined, present particularly numerous and interesting points of contact with the illustrations of the Cosmography printed in Ulm in 1482. The other sheet which offers interesting points of comparison is 31 recto. The tabula IV et ultima Affrice, which extends from the Red Sea to Fretum Herculeum may have served Leonardo for his considerations on the original events in the Mediterranean before the separation of Gibraltar, and derived perhaps, through Strabone or another source, from Strato of Lampsacus. Cf. Duhem, �tudes sur L�onard de Vinci, cit., Deuxi�me s�rie, Paris, Hermann 1909, pg. 293-294; Strabone, Geografia, I, c. III, � 4. Il Duhem (op. cit. 1�re s�rie, pg. 183) also provides an opportunity to highlight the very probable connection between Leonardo�s claim (Leicester manuscript, sheet 31 v.) regarding the difference in level of the Caspian Sea, the Ponto Sea, the Propontico and the Aegean, and regarding the ebb of the Mediterranean waters towards the Gaditan strait (see above, note 8, pg. 19) and Aristotle�s Meteorology (lib. II, chap. I). Further comparisons may be made for some other fragments of the Atlantico Codex; specifically for sheet 95 v. -b, giving rise to a more correct reading and interpretation of the text. Compare with sheet 95 v.-b of the Atlantic Codex with the plates VII, IX and X Asie and corresponding text by Ptolemy. The original transcription of the Atlantic Codex, in the note regarding the courses of the Oxus, Indo and their tributaries, should be corrected at the beginning as should the critical transcription in various points, one should, in other words, read: �Mon Caucasus, Comedorum e Paropanisi� (instead of �mon e a nonsus [?] come Dorun e Paropanisi�), �Dragamaim� (instead of �Dragama im�), �per levante Suastus, e Coe per ponente� (instead of �per levante Suastus, e cio� per ponente�). Richter (op. cit, II, � 1111, pg. 269) in this case gave a more genuine interpretation. Solmi, who cites the same passage from the Atlantic Codex (see Le Fonti, etc., cit., pg. 268) making the inexactitudes pointed out here rather worse, seems to have erred in believing this information as taken from Strabone. For the other fragment of the same page, regarding the course of the Ganges, cf. the map X Asie. Of the two lacunae left by the transcriber, I believe the first should read �500�, and the second �esoas� (�e Soas�). The other source, which it is worth spending a few words on, is suggested by two notes already mentioned, See above, pg. 17. one on sheet 192 r. d of the Arundel Codex: �cierchi in firenze dellaram�dina�(look for the ramodina in Florence), and the other on sheet 2 r. of the Leicester manuscript: �to laram�dina�. The form of these two brief annotations, which is rather strange upon first impact, does not provide any better supposition than to imagine that Leonardo was referring to a printed work Cf., by analogy, manuscript F, 20 verso of the cover sheet: �cerchi [o piuttosto �cercha�] di uetruuio tra cartolai�[Look for Vetruvio among the map-maker�s]. Since I have mentioned Vitruvio, I would like to take this opportunity to recall with regard to the treatise on water (as well as the note, dated considerably later, of manuscript G, on the ship�s log which one can see a comparison of in Solmi, Le fonti, etc., cit., pg. 299), some notes left by Leonardo (on a topic proposed (sheet 3 r., cf. pg. 11, no. 4 but not discussed in the Leicester manuscript) on sheet 80 r.-b of the Atlantic Codex: �Del conoscere l�acque a� fumi de� colli e a l�erbe, e giunchi, e terreno. Della bont� sua, secondo i fondi de� fiumi, e �l suo correre, la bont� de l�acqua stillata per nuvoli, o di vena, o di citerna; del diversificarsi mediante la natura de� condotti o miniere, donde passa; e per dare ai prati; del conoscerla con vasi crudi sotterrati, e con panni scaldati, e col pesarla�. [On recognising water on the basis of mountain streams and of grass and canes and soil. On its goodness which varies with the river bed and the speed of the river, the goodness of distilled rainwater or spring water or from cisterns; on how water changes depending on the nature of its conduits and depending on the minerals present in the soil through which it passes; and which is deposited through the meadows; to analyse it, it must be kept in raw clay vessels underground and weighed using heated cloths.] The ways of knowing water mentioned here may be found in Vitruvio�s Architettura (VIII, I), although one could not say that the passage quoted in the Atlantic Codex is taken directly from it. The same means are, for example, suggested by Piero Crescenzio in his Agricultura altro dei fonti di Leonardo, which is noted on sheet 210 r.-a of the Atlantic Codex and on sheet 141 v. of the W.L. manuscript (Richter, op. cit., II, � 1435, pg. 431), also containing the following observation: �Ma sapere dei che il peso e uno degli sperimenti che aiutano a conoscere la disposition dellacqua. per� che lacqua la quale e pi� leggeri nel piu delle dispositioni e migliore: e il peso siconoscie per uia dimisura & anche siconoscie se in due acque diuerse due panni dunpeso simmollano: & appresso si secchano fortemente & poi sipesino impercio che lacqua il cui panno sara piu leggiere sara migliore.� [Knowing that the method for weighing water is one of the experiments which helps to recognise the quality of the water and the lighter it is the better it is: and to find out its weight two cloths of the same weight may be immersed in two different types of water and then dried and weighed and the lighter cloth will be the one immersed in the better water.] (Crescenzio, Della Agricultura, book I, chap. IV; I quote the edition printed in Vicenza �per me leonardum de basilea die. XVII. mensis Februarii anno D. MCCCCLXXXX�): a passage which Leonardo�s briefer note corresponds to (Atlantic Codex, sheet cit. ): �Del saggiare le qualit� dell�acque per peso, con due panni bagniati�. [On testing the quality of water by weight using two wet cloths] One might also observe that chapters II (on the air), III (on the winds) and IV (on water, mentioned above) of Piero Crescenzio�s Agricultura rely on (see the beginning of each and, for chapter IV, on water, the citation within the chapter) the authority of Avicenna. Having found here or elsewhere (since as we have seen this news was passed on easily from one writer to another), such indications might, in my opinion, account for the note on the recto of the cover sheet of the F manuscript: �avice na de liqujdi� (for a different theory cf. Solmi, Le fonti, etc., cit., pg. 79). Regarding the use of the words �liquids� and �liquid bodies� in Leonardo�s manuscripts, I would like to observe that sometimes he attributes a meaning to them similar to that normally given (cf. Leicester manuscript, sheets 1 r.; 30 r.), and sometimes a much broader meaning, including not only liquid bodies in the strict sense of the term but also air (Leicester manuscript, 25 r.; cf. Atlantic Codex, 168 v.-b, 271 r.-e) and fire itself (Atlantic Codex, 227 v.-b). Those clues for finding hidden water, mentioned by Vitruvio, are also repeated by Leon Battista Alberti in chapter 4 of book X of his Architettura (I have and quote from the translation printed in Vinegia by Vincenzo Vavgris [Valgrisi), 1546, sheets 222 r.-222 v. and 223 r.). Many comparisons could be made between Alberti and Leonardo in terms of the analogies of the topics discussed in the Architettura of the former and in the Leicester manuscript, as offered by the references to inventions used in naval warfare (Arch. cit. v. 12, sheet 104 r.; cf. Leicester manuscript 22 v.), some observations on the circulation of water (op. cit, ed. cit., X. 3, sheet 220 v.-221 r.; cf. Leicester manuscript, 21 v., throughout), of springs bursting forth again on account of earthquakes or for no apparent reason (op. cit, X. 3, sheet 221 v.; cf. Leicester ms., 11 v.); regarding the difference in height required for the motion of water and levelling techniques (op. cit., X. 7, 229 r. and v.; cf. the references in note 8 on pg. 19 on the subject of the deposition of fluvial matter, on the effects of flooding, of the collapse of river banks or bridges (op. cit., X. 10, 236 r. and v.; cf. Leic. Ms., throughout); on the ebb and flow of the sea, compared to the breathing of man (op. cit., X. 12, 239 r.; cf., for Leonardo, as well as sheets 17 v., and 34 r., of the Leicester ms. also sheet 26 r.-a of the Atlantic Codex); regarding the places occupied by the sea in ancient times in Egypt and in Cilicia (op. cit, X. 12, 239 v.; cf. Leicester ms., 10 v.; 31 v. (margin note); and 31 r.); on the purging of rivers with nets or using animals (op. cit, X. 12, 240 r. e v., 241 r.; cf. ms. Leicester, 22 v.); etc. For the ship�s log see above no. 8, on pg. 18. In the V book of Architettura (op. cit, 103 v.), Alberti refers to the �libellus qui navis inscribitur� (according to the Latin text), which Leonardo wishes to consult later, on sheet 13 r. of the Leicester manuscript. or manuscript which he was interested in or from which he expected to obtain interesting opinions on the more obscure or most debated questions among the �filosafi� (philosophers).